Oss, 20 November 2018 – Analysis of drug binding kinetics is important in predicting the physiological activity and selectivity of drugs. To make such experiments readily accessible on a single platform, NTRC has developed its ResidenceTimer™ service. It comprises over 72 kinase drug targets, all validated by reproducible binding of reference drugs . As of today, NTRC has added six new important kinase drug targets to its ResidenceTimer™ service: CDK9/CycK, CDK9/CycT1, CDK7/CycH/MAT1, MERTK, TYRO3, and GSK3β. The cyclin dependent kinases CDK7 and CDK9 play a role in transcription and are important targets for the treatment of cancer and immune-related diseases. For instance, CDK7 is overexpressed in some types of breast cancer, and CDK9 is overexpressed in pancreatic cancer. MERTK, TYRO3 and GSK3β are important drug targets for cancer and immune-related diseases. 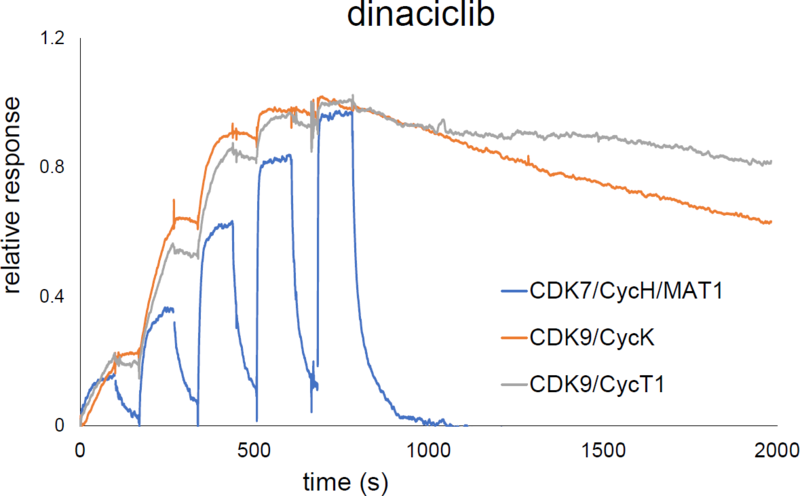 After immobilizing the kinases, NTRC scientists were able to show that for instance dinaciclib, a CDK inhibitor currently in Phase III clinical trials, slowly dissociates from two different CDK9 complexes and fast from CDK7 (Figure 1). On the other hand, the more experimental CDK inhibitor PHA-793887 binds more strongly to CDK7 compared to CDK9, indicating that it is possible to develop selective inhibitors for either CDK7 or CDK9. The ResidenceTimer™ platform is based on surface plasmon resonance in combination with specific immobilization of biotin-labelled kinases. The kinases were expressed and purified by NTRC’s partner Carna Biosciences Inc. from Kobe, Japan. Willemsen-Seegers et al. (2017) Compound Selectivity and Target Residence Time of Kinase Inhibitors Studied with Surface Plasmon Resonance. J. Mol. Biol., 429: 574-586.